She built her house in 3 years and traveled 15,000 miles across the USA & Canada. Tiny Hell on Wheels is Hilarie's self built tiny house. She started her build in September of 2014. 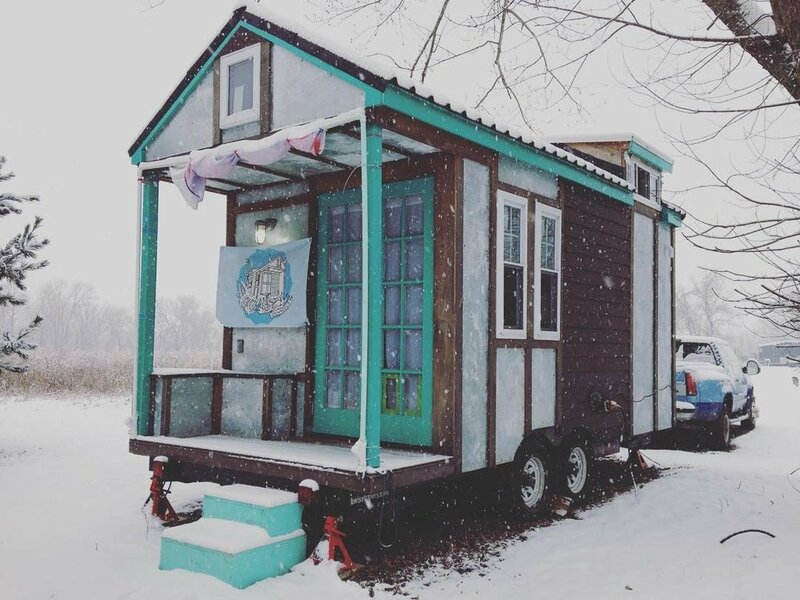 It took her almost three years of on and off building, of saving money, of healing from illnesses, of losing family members and of immense self growth to finally move into her tiny dream house. Her dream was to move out of her mom's house but she didn't want to throw money in the toilet by renting an overpriced and unkempt NJ apartment. Instead, her mom, Kandi, let her daughter build in the backyard. Three years later she hit the road, traveling over 15,000 miles in the first year and meeting people that would change her life forever. She is currently parked in a small North Bay Area town in California. R30 insulation and propane heat help keep this tiny house toasty warm! Taken minutes before I left for CA, I had my truck and house packed full of all my belongings and tools. Are you dying to ACTUALLY TOUR Tiny Hell on Wheels? Here are the events T.H.O.W. will be attending. Want to hear Hilarie speak about her experiences? Here are some past appearances with links to her speeches! Hilarie's whole life has been a centered around crafting whether it be knitting, sewing, painting or most recently, wood working. She's always had a studio and always had the need to create. Visit her Etsy page *coming soon* to purchase her creations or order custom work to help support Tiny Hell on Wheels! Do you ever think to yourself, "Self, I truly wish I had a sticker with Crusher's face on it... or even a shirt or sticker with that dope Tiny Hell on Wheels logo"....... your wishes have been granted. Email Hilarie at hilarie@tinyhellonwheels.com to order today.